This week the ranch enjoyed a visit from Diana Black, one of Hays County Extension Office’s Master Gardeners. The Master Gardener program is a volunteer program that operates though the Texas A&M AgriLife Extension Offices. The Extension Office really provide a great service for our ranch, from helping us test our pressure gauges on the canning equipment, to offering guidance and best practices in planting, fertilization and irrigation in the garden. In our site visit this week, we took a look at and discussed some of the concerns I have been having about plant life in the garden. It was great to hear stories from Diana’s own garden, and to know that the things I am seeing in the beds is not so different from what is happening in the rest of the Hill Country. Okra seems to have done poorly generally, mostly due to the cooler lead into summer not allowing soil temperatures to rise high enough to support healthy growth. Tomato plants have succumbed to diseases bred in the moist cool climate we had been experiencing. Just about everyone was shutting down their plants for the summer due to the prolonged high heat and dryness we now face. She did confirm for me that I should test each raised bed individually as I try to gauge the nutrient levels of our soils, and I have sent samples off to A&M. She also suggested that I might be able to be even more aggressive in my shading, as she uses up to 60% shade cloth on her garden, while we are working with only a 40% cloth on ours. She also had some great recommendations about nurturing the plants, including the use of compost tea, a technique I will be checking out to try to bring the peppers and sweet potatoes through the unrelenting heat of out Texas’ August. 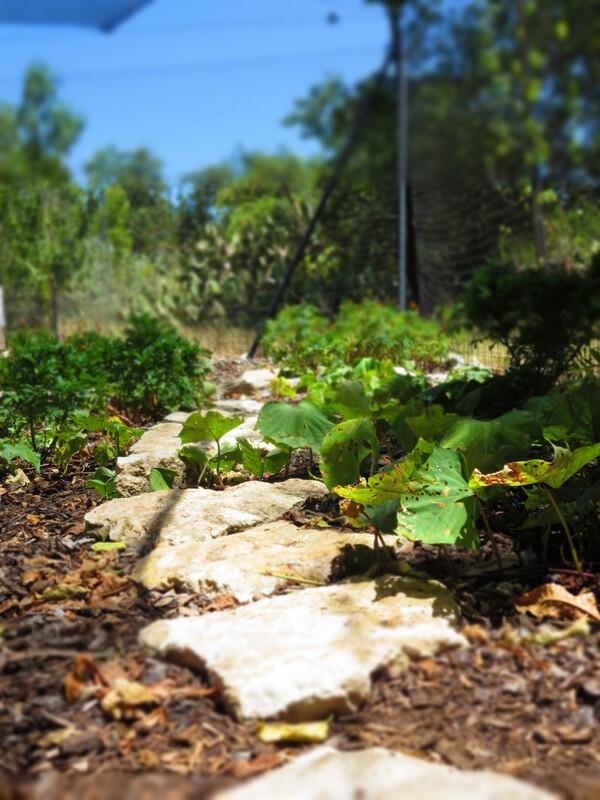 A cat’s eye view of the stepping stone path through our sweet potatoes. These plants should be ready for harvest some time in October. With the current heat and the already weakened state of our tomatoes, cowpeas, and peppers, as well as the quickly depleting reserves of harvested rainwater, we have decided to pull the plug on all but the peppers and sweet potatoes for the season. We have already consumed about two-thirds of our 2000 gallon rainwater reservoir, and we are probably looking at about a month or more of high temperatures and no precipitation. Considering that the tomatoes, cowpeas, and okra had already dramatically decreased production as the heat of summer hit earlier in July, we felt it was best not to use our reserves to keep these plants alive. Sweet Potatoes and peppers, on the other hand, are loving this heat, and should not require nearly as aggressive a watering routine to maintain health and vibrancy. They will almost certainly need a nutrient boost to help them over the summer heat hump, but with that boost they should thrive and produce an excellent harvest. I look forward to seeing how the compost tea will help them.